Summertime… What does it mean to you? 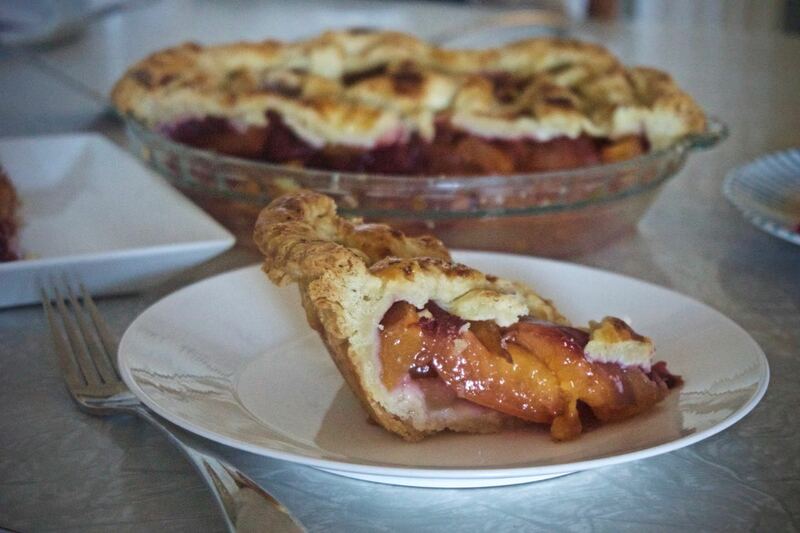 For me, summer is never complete without a peach pie. This year I experimented with nectarines in place of peaches. We tried out a nectarine and blackberry pie with an all butter crust. Nothing beats a ripe nectarine for snacking, standing over the sink, letting the juice drip down your hands. But baking? My interest was piqued when I heard they can be baked without peeling, which can be tedious when preparing peaches. The Little Birds and I picked up extra sweet Carmen Miranda nectarines from a local farm at Specialty Produce. My four-and-a-half-year-old loves baking and she helped with every step. She even took this picture of me and the pie dough. Here I am shaping half of the dough into a disc before chilling it in the refrigerator for half an hour. These nectarines were so sweet there was no need to add any sugar. In fact, I added a splash of lemon juice to try to cut the sweetness. Because they were ripe and juicy, I added a little tapioca flour to thicken up the filling. You could use flour or cornstarch, but I think they leave a starchy taste. This recipe has zero added sugar, unless you want an optional sprinkle of a pinch of turbinado sugar on the top crust. We love eating sweet, fresh summer fruit simply. But a pie is one way to celebrate the fruit and make it the star. And the verdict? 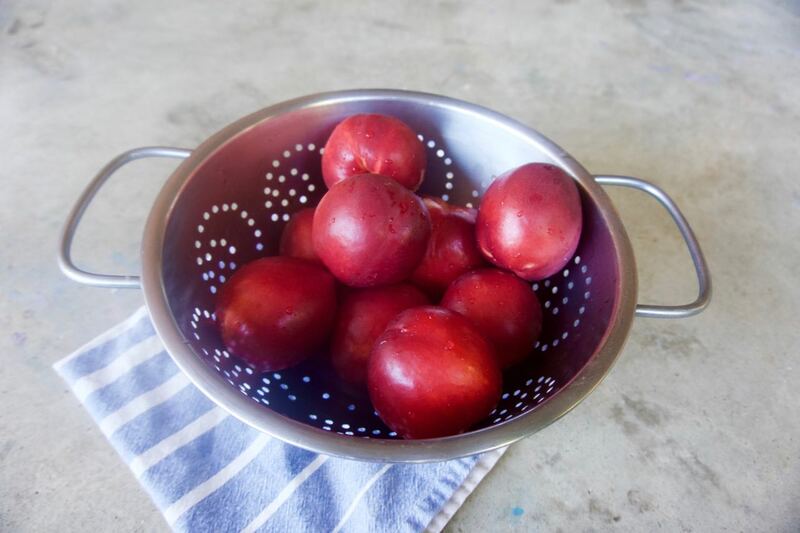 These nectarines almost reminded me more of baked plums than baked peaches. I liked the bit of pink the skin gave the fruit, and didn’t mind the texture of the skin one bit. But as far as being easier to prep than peaches… I had a hard time cutting the nectarines off the pit. The don’t fall off the pit nicely like peach slices. Then I figured out the trick of cutting them squarely. Here is another trick for you: if you brush a little bit of beaten egg white on to the bottom crust, it can help prevent a juicy filling from getting the bottom crust too soggy. Cracking an egg, beating the egg, and brushing it on are all great jobs for kids! 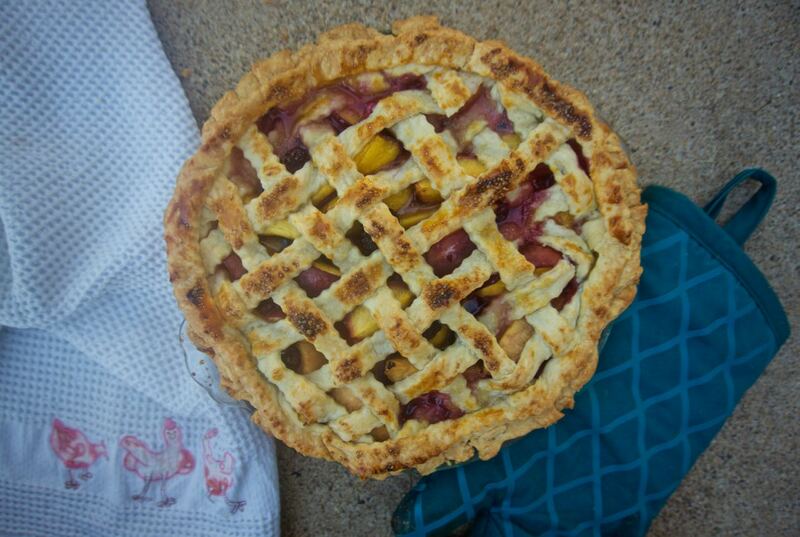 A lattice top is pretty classic for a peach or nectarine pie. I rolled out the second half of my crust recipe and used a ravioli cutter to slice strips with a fluted edge. Use the longer strips in the middle and the shorter pieces on the edges, and weave over and under. Can you tell in this photo where I messed up the pattern? The extra bits of crust went to Little Bird to make her famous pie crust cookies. Enjoy with vanilla ice cream for dessert, or simply as is for a sorta healthy breakfast! A twist on a classic American peach and berry pie makes use of peak of season nectarines and blackberries. Prepare an all butter pie crust according to instructions, chill in the refrigerator while you prep the fruit. Wash and cut the nectarines. Wash the berries. Toss with the tapioca powder and lemon juice. Set aside. Roll out the first pie crust and gently place in the bottom of a 9" pie pan. Brush a thin layer of beaten egg white over the dough. Gently pile the fruit into the pan. Dot with little bits of butter. Roll out the second pie crust, then cut into slices. Decorate the top, weaving over and under, until a lattice covers the top. Brush the top crust with a bit of milk and/or sprinkle a bit of turbinado sugar. Bake for 45 minutes or until the crust is browned and the fruit is tender. 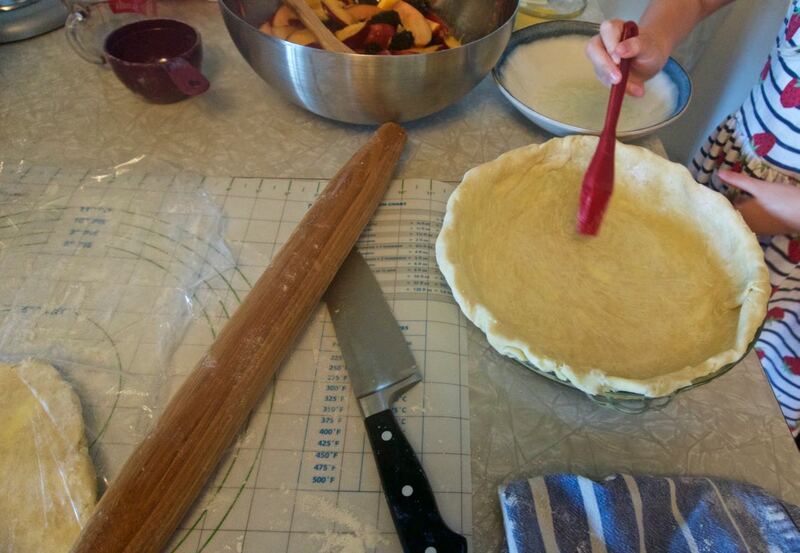 IMPORTANT (and hard): Let the pie sit for at least one hour before cutting. S’mores Baked Alaska is a recreation of a delicious dessert we have had several times at Waypoint Public in North Park. 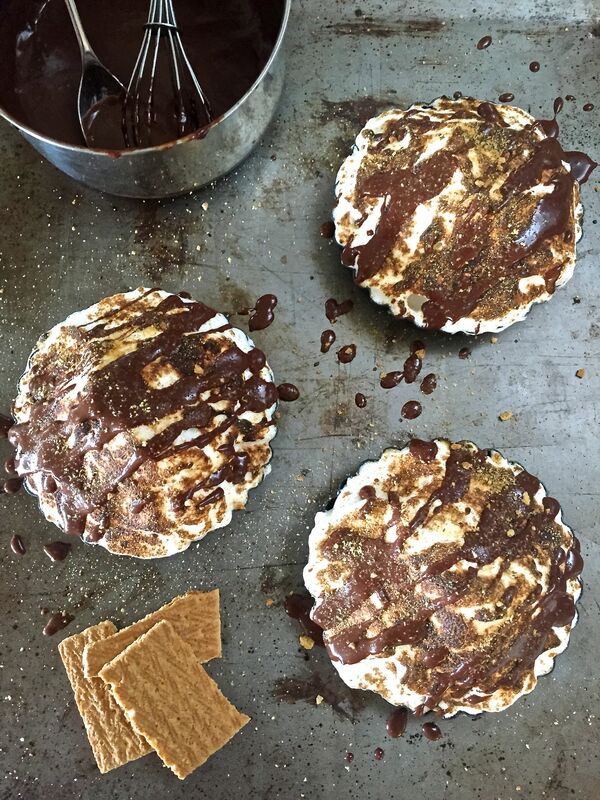 A meringue top is toasted, like a perfect campfire marshmallow, covering a scoop of chocolate ice cream and a crunchy graham cracker crust. This recipe was also the perfect excuse to try out the blowtorch Papa Bird gave me for Christmas. Being a food blogger, cooking gadgets are always a good call for gifts. As usual, Little Bird helped out on every step, except maybe the blowtorching. The recipe is actually pretty easy. The crust is just graham cracker crumbs with melted butter, pressed into pans. You could make crumbs easily with a food processor, but giving a three-year-old license to whack anything is fun. It’s also a good emotional outlet, as I learned during a school social work internship. I thought about making something more like homemade marshmallows for the top (like this David Liebowitz pie), and thought I had gelatin leftover from the last time I made pumpkin cheesecake with cranberry gelee, but I was out. I might try marshmallow next time, if I’m feeling ambitious, but a simple meringue totally worked. We topped it like the restaurant with a drizzle of chocolate syrup and graham cracker crumbs. Yum!! Our whole family has always enjoyed Waypoint Public. It is one of the few places with an indoor play area. That’s not McDonald’s. But an actual restaurant with tasty food. In fact, their executive chef, Amanda Baumgarten, was a contestant on Top Chef. Tip: They have a back room for private events. We hosted my sister’s baby shower there in December. All of the staff were very accommodating. This a recreation of a dessert from Waypoint Public restaurant in the North Park neighborhood of San Diego, CA. Preheat oven to 350*F. Place 8 graham crackers in a gallon-sized zip-lock bag and seal. Use a rolling pin to crush the crackers until they are broken into uniform crumbs. See video above. (Or pulse in a food processor.) Place ½ cup of graham cracker crumbs in a mixing bowl with the melted butter. (Reserve the rest of the crumbs for decorating.) Stir the crumbs and butter until combined and then press into three four-inch tart pans or ramekins. Put the mini pans on a baking sheet and bake for about 6 minutes. Allow to cool completely, but leave on the baking sheet. Place a scoop of ice cream in each cooled crust. Leave a rim of crust around the edge uncovered. This will allow the meringue to completely surround the ice cream and make a good seal with the crust. Place the baking sheet and pans in the freezer to chill a bit while you make the meringue. Separate the eggs and place in a clean bowl of a mixer with the vanilla and cream of tartar. Using a wire whisk attachment, beat until soft peaks form. Slowly sprinkle in the sugar a little at a time, and beat until stiff peaks form. Pipe or spoon the egg white mixture over the ice cream, making sure you bring it all the way down to the edge of the pie. 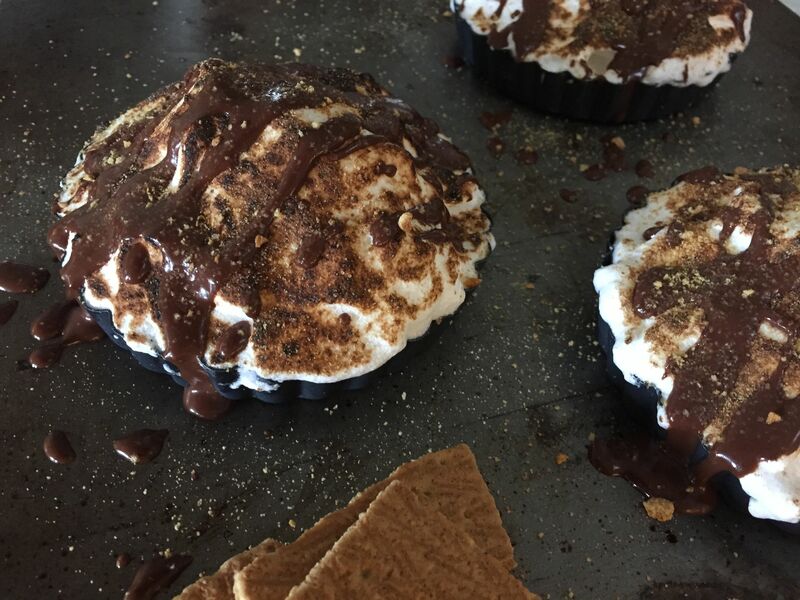 Using a kitchen blowtorch, carefully toast the outside of the meringue. Decorate with a little chocolate syrup and graham cracker crumbs and eat right away. You can refreeze any leftover pies. I’m happy to share one of my husband’s specialties: Smoked Salmon. After we enjoyed my uncle Bobby’s homemade smoked salmon so much, I gave my husband what we call a “Bobby grill” for his birthday. The Bobby grill is actually a Portable Kitchen Cast-Aluminum Grill and Smoker (Amazon link) but in my family, everything gets named and claimed! This post was sponsored by Whole Foods La Jolla, who generously provided all the ingredients for this Smoked Salmon recipe and the following “latkes and lox.” Papa Bird points out that this recipe makes a “hot-smoked” salmon, even though it uses indirect heat. True lox is made with a cold-smoking process. Although I usually seek out wild salmon, I found myself gravitating to the fresher-looking farmed salmon at Whole Foods. The woman at the counter explained that all of the wild salmon was previously frozen, as the Alaskan season has ended. The farmed salmon was fresh and had never been frozen. Usually I avoid farmed salmon as a big “no no,” but again I was educated. The Monterey Bay Aquarium’s Seafood Watch (my go-to source of info) writes: “Most farmed salmon is on the “Avoid” list due to concerns such as the use of antibiotics important to human health and the potential for parasite and disease transfer to wild salmon populations. The Marine Stewardship Council certifies some salmon fisheries as sustainable.” Whole Foods lists which fish meets Marine Stewardship Council criteria. Their salmon farmers use recirculating aquaculture systems, which is a “Best Choice” for consumers. It is also a more affordable choice! Adapted from "How to Grill: The Complete Illustrated Book of Barbecue Techniques, A Barbecue Bible! Cookbook" by Steven Raichlen. Remove the skin the salmon and remove any bones. Rinse the salmon in cold water and blot dry. Place the salmon in a baking dish and pour the rum over it, covering completely. Let sit for 30 minutes in the fridge. Then drain the salmon and blot dry. Mix the brown sugar, salt and pepper in a small bowl. Spread one third of the mixture in a clean baking dish. Lay the salmon on top and sprinkle the rest of the cure on top, patting it into the fish. Let cure in the fridge for 4 hours. Set up grill for indirect cooking. The coals should be off to one side and the fish will go over to the other side. Place 4 cups of wood chips in a pan of water to presoak. Place a drip pan under where the fish will go, and preheat grill to 325*. Rinse off the cure off the salmon with cold water and blot dry. Rub honey into the salmon on both sides. Toss 2 cups of wood chips on the coals. Brush and oil the grill grate. 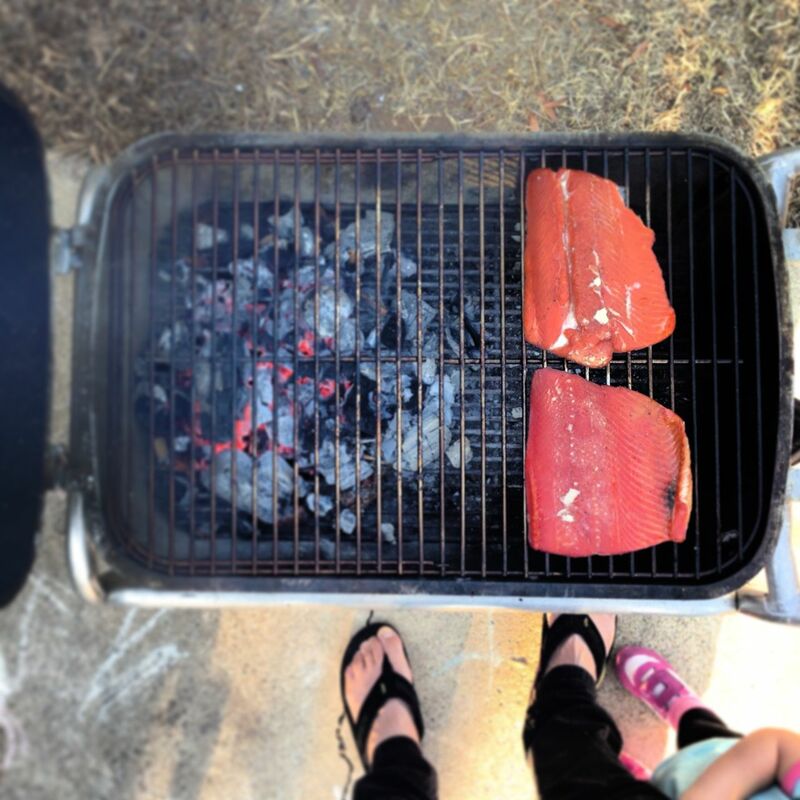 Place the salmon on the opposite side as the coals, and over the drip pan. Toss 2 more cups of wood chips on the coals and cover the grill. Smoke the fish until cooked through, about 20 minutes. The fish should feel firm and break into clean flakes. Transfer to a rack to cool. Serve warm, room temperature or cool. Keeps in the refrigerator for 3-5 days. Papa Bird notes that salmon fillets work better than steaks. He prefers thinner fillets over thick, meaty ones. More surface area to come into contact with the cure and the smoke. 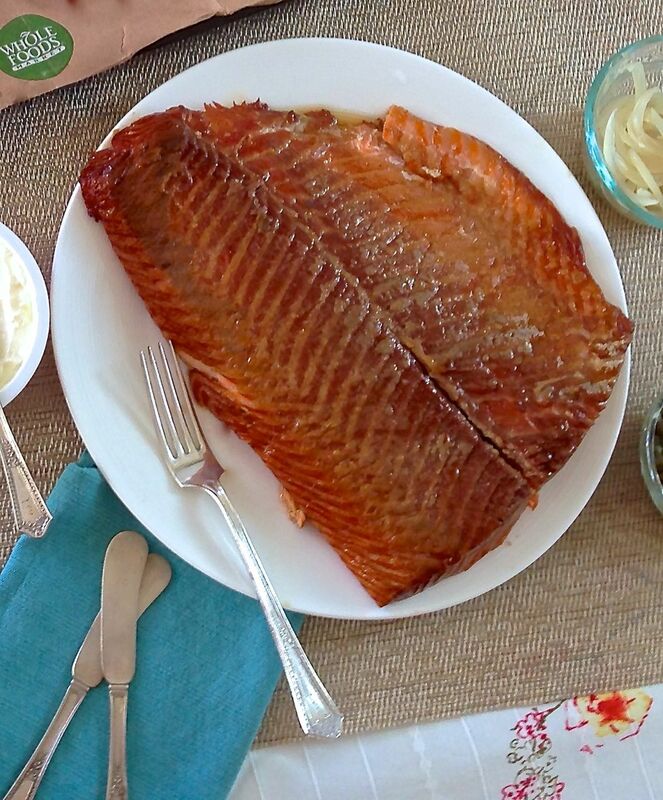 Click on any image in this gallery for step by step photos on how to make smoked salmon at home. Papa Bird likes to use a mezza luna knife to remove the skin from the salmon. The kind people at the Whole Foods fish counter would be willing to do this for you, too. Pour dark rum over the salmon and soak for 30 minutes. Mix brown sugar, kosher salt and pepper to make a cure for the salmon. Thank you Whole Foods La Jolla for the ingredients! Bury the salmon in the cure and refrigerate for 4 hours. Rinse off well, so it won’t be too salty. Enjoy with cream cheese and flatbread, or with latkes and creme fraiche, as in my next post! Many thanks again to Whole Foods La Jolla! They provided me with all of the ingredients, free of charge. (The recipes and opinions are all mine.) 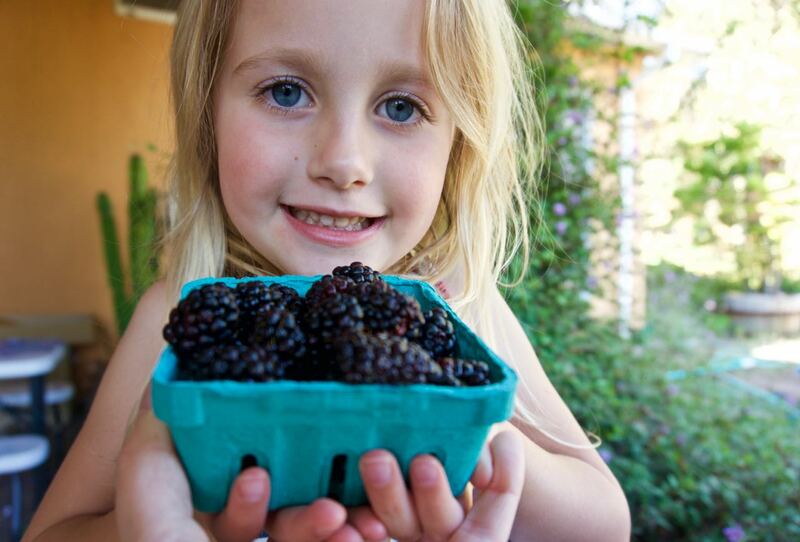 Follow them on Twitter at @WFMsandiego and #wfmlajolla. (Follow my tweets @BabyBirdsFarm). You can pin this recipe on Pinterest here, and follow my Jewish Food board for more noshing. 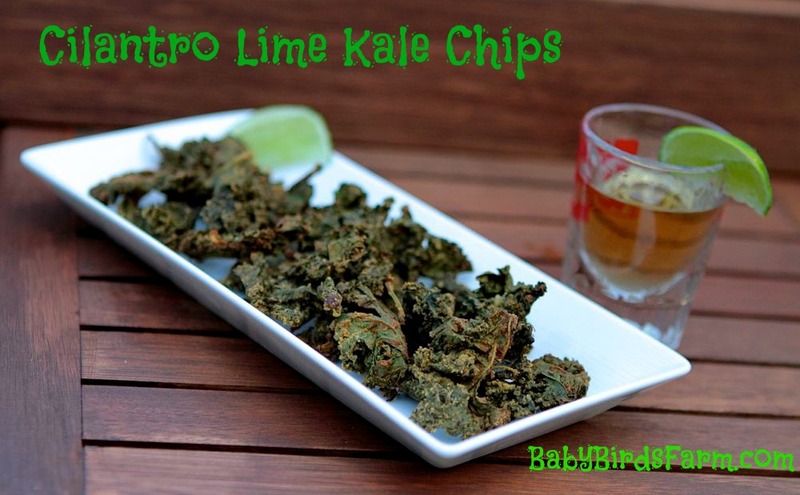 These cilantro lime kale chips are addicting! A little spicy, sweet, salty, tart and bitter… they hit a nice balance. The cilantro is just enough not to overpower and the lime and creamy nuts keep the heat, which creeps up later, from being too hot. I asked Papa Bird what he thought of the “sauce” after blending it. “Does it need anything?” He said, “A cool ginger beer with tequila to wash it down.” I’ll take that as high praise. Check out yesterday’s post on easy kale chips, or “kale crunchies” as Little Bird calls them, for more on the basic technique. They are yummy and satisfying, but cook them a little too long and the kale can get bitter. Once I felt I had a good balance of time and oven temperature, I was longing to experiment with a creamy sauce, and came up with this cashew based recipe for cilantro lime kale chips. I actually started the recipe without realizing that I was almost out of cashews so I used a combination of cashews and raw hazelnuts. Our cilantro plant is taking off which is what pushed me in the cilantro direction. I also used a mild green chili Papa Bird had just pulled out of the garden. I thought the raw kale dressed in the sauce would make a delicious salad without cooking. I was afraid it would be too spicy for Little Bird, but after baking, the spiciness mellowed out a little. Or – Purchase kale pre-washed, such as the cut organic kale from Trader Joe’s. Just make sure to remove the thick center ribs as they do not dehydrate well. 2. Blend the rest of the ingredients in a food processor or a good blender (like a Vitamix.) If the blender struggles, add a little water, a tablespoon at a time, until it blends well. Blend at highest speed until smooth, scraping down the sides at least once. Click on any photo in the gallery below to enlarge, or scroll through them all for step by step instructions. Blend everything but the kale and then massage the “dressing” into the kale. I think this would be delicious raw as a salad, too. Spread evenly onto a silpat lined baking sheet. Enjoy, perhaps sipping on an añejo? 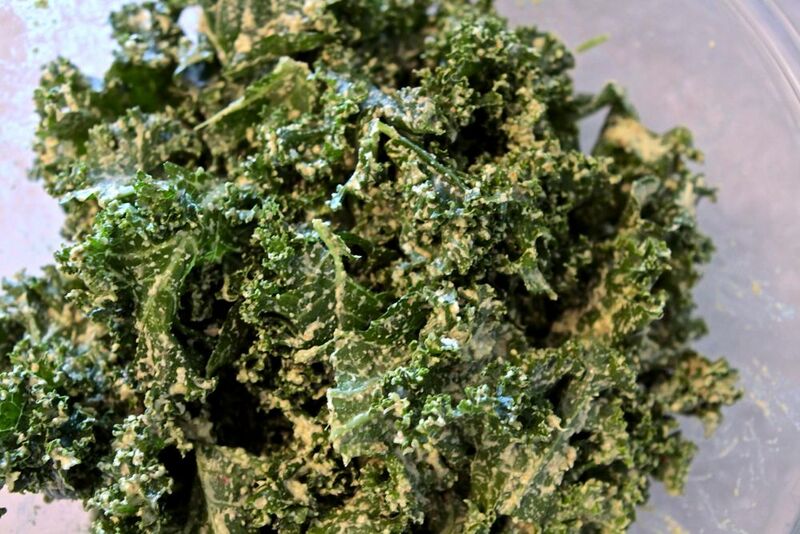 Do you love buying kale chips for snacking but get tired of paying so much? You would be surprised how easy homemade kale chips can be. I have been experimenting with several recipes, techniques and temperature/time combinations over the last year, and the following recipe has been the best so far. Or – Quick and Easy Tip: Purchase kale pre-washed, such as the cut organic kale from Trader Joe’s. Just make sure to remove the thick center ribs as they do not dehydrate well. Don’t bother washing or drying them, the drier the kale is the better it will crisp up. 3. 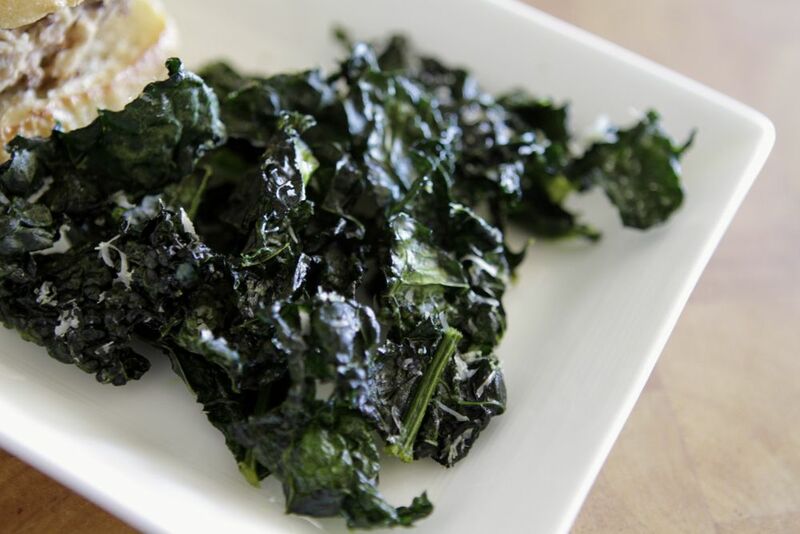 Spread kale onto a baking sheet lined with parchment paper or a silicone mat. Bake for 45 minutes or so, checking and gently stirring the kale every 10-15 minutes, until it is dried out but not overly toasted. Options: You can toss them with a little parmesan cheese or your favorite seasoned salt. Try a little cayenne or spice. Click on any picture in the gallery below to expand. Spread the oiled kale evenly on a baking sheet. After 10 minutes, give the kale a quick stir. Here they are served with my Anasazi Bean Burger. Check back tomorrow for my favorite variation on these easy homemade kale chips, Cilantro Lime, made with a slightly spicy and creamy cashew sauce.